Recently on NPR Radio's All Things Considered [Trusted Advisor Recounts Obama's Evolution], David Axelrod, chief strategist for Senator Barack Obama, was asked whether Obama was 'tough enough' to win the presidency. Echoing doubts about Obama's toughness, the show's host, Michelle Norris, said: "Success in politics sometimes, in fact often, means having to close your eyes or even hold your nose and do something you might not like to do but have to do if you keep your eye on the ball." Axelrod replied: "Well, that's an interesting question. Maybe we'll test the proposition. I believe he [Obama] has the ability to make a very tough case on behalf of the things he cares about, and he'll fight very hard for them. You're asking a different question which is: Does he have the ability to be underhanded, will he pull the trigger on the gratuitous negative shot you often see in politics. The answer to that is probably no." "I don't think that's toughness," Axelrod said. "I think that's something he's committed not to do. The question is: What does the country want right now? Do they want to continue the kind of politics we've had that has led us to the morass we're in? Or, do they want someone who can really lift us, bring us together and, as Lincoln said, fulfill the better angels of our nature and move this country forward? We'll soon find out the answer to that question." David Axelrod's comments are right on the mark. Obama does not have to sell his soul to get ahead in politics. No one does. Indeed, the deepest truth of politics is quite the opposite from what is too often presumed to be necessary. Politics is not dark and dirty by nature. It is what we choose to make it. But only a noble soul can unleash a noble politics. A nation can choose darkness or it can seek the light. In either case, the means used to arrive at a political victory determines the form of the regime that will ensue. The means used to gain an election victory are not neutral to the outcome of that effort. They are the form of the administration to follow. This comment reflects the notion of 'proper proportionality.' It also reflects the deeper truth of the logical principle that "the ends DO NOT justify the means." How a candidate acts during the election campaign indicates the nature and quality of the political regime that such a candidate will create. The means used to gain power is the form of the power that will be exercised. An election therefore is not merely about winning or losing. It is about the kind of leaders we want, it is about the kind of qualities we want to make incarnate in our lives, it is about the kind of people Americans want to be, it is about the kind of country Americans want to create, and it is about the kind of America we Americans want to project to the world. Whatever means a candidates uses to win an election will determine how these larger questions are answered in the years to come. 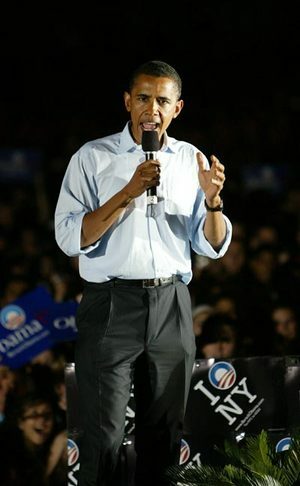 For his part, Obama has the capacity to summon heroic forces from the spiritual depths of ordinary citizens and to unleash therefrom a symphonic chorus of unique creative acts whose common purpose is to tame the soul and alleviate the great challenges facing mankind. For their part, each citizen has within the potential to respond to such a heroic calling. When they do, noble qualities are unleashed from the very depths of the human spirit. When they do not, a politics of fear ensues. In either event, the choice is ours to make. Unlike other candidates, Obama is an inspired leader. He is authentic and truthful. He radiates truth and goodness. He possesses charisma and exercises sound judgment. For this reason, he serves as a catalyst to awaken the better part of ourselves. His campaign is about calling America to exercise the noblest human qualities on behalf of the common good. More than anything else, it is this drama that needs to occupy center stage in American politics today. Hat Tip to Sagereader: Think On These Things and here. See also Vox Nova. Barack Obama’s dream is—Bring about real change, change that we can believe in. His passion for change is the pillar of his Personal Brand. Parts of his speeches: “America is a land of big dreamers and big hopes. It is this hope that has sustained us through revolution and civil war, depression and world war, a struggle for civil and social rights and the brink of nuclear crisis. And it is because our dreamers dreamed that we have emerged from each challenge more united, more prosperous, and more admired than before…….The true test of the American ideal is whether we’re able to recognize our failings and then rise together to meet the challenges of our time. Whether we allow ourselves to be shaped by events and history, or whether we act to shape them. Whether chance of birth or circumstance decides life’s big winners and losers, or whether we build a community where, at the very least, everyone has a chance to work hard, get ahead, and reach their dreams….Change will not come if we wait for some other person or some other time. We are the ones we’ve been waiting for. We are the change that we seek…. I don’t want to settle for anything less than real change, fundamental change - change we need - change that we can believe in. It’s change that I’ve been fighting for over two decades ago. Because those dreams - American dreams - are worth fighting for”. Like Mahatma Gandhi, Martin Luther King Jr, Nelson Mandela, and Mikhail Gorbachev, Barack Obama is a man of peace, passion, integrity, vision, and love who is fighting against oppression and political corruption. Hillary Clinton is not trustworthy.